Partly cloudy. Low 64F. Winds SW at 10 to 20 mph.. Partly cloudy. Low 64F. Winds SW at 10 to 20 mph. The developers of a 10-acre site on Charleston's upper peninsula are looking for community input before moving forward with a building concept. 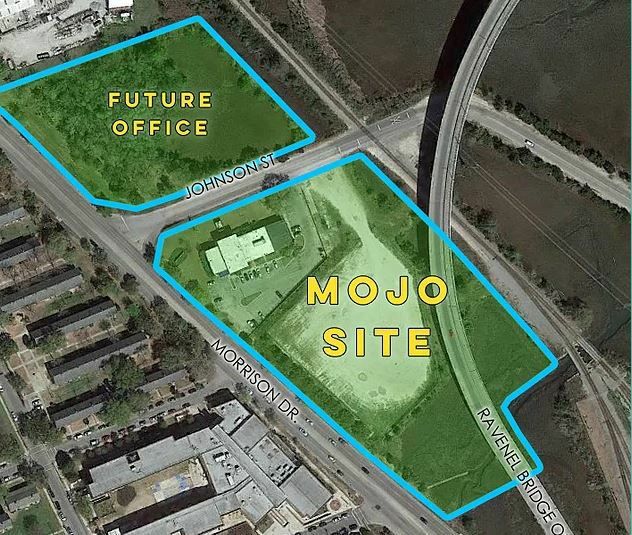 The property, bought by Origin Development Partners of Mount Pleasant for $9.2 million earlier this year, encompasses several parcels formerly owned by the State Ports Authority along Morrison Drive and abutting the Ravenel Bridge on-ramp to Mount Pleasant. The site has been dubbed Mojo because it's near Morrison and Johnson Street. Part of it is set aside for office space. The city's Planning Commission recently approved 4½-story buildings for the site, but Origin and partner Woodfield Development wanted to get public feedback before presenting any formal plans. A charrette will take place Thursday and Friday in the Cedar Room at the Cigar Factory at 701 East Bay St. in suite 200. It will include city staff and political leaders from 10-11:30 a.m. Thursday, followed by the design team answering questions. Several Charleston organizations and nearby stakeholders will give their input 1-2:30 p.m. Thursday. From 6-7 p.m., neighborhood leaders and the community at large can provide feedback. At noon Friday, the charrette will wrap up, with a question-and-answer session led by the design team to follow at 1 p.m.
Charleston's suburbs continue to bustle with new development, and a community near Summerville now offers another housing option. A new 329-unit apartment and townhome development is now open in Nexton in Berkeley County. Alta Brighton Park offers a saltwater pool, resident beer garden and hammocks overlooking the lake at 115 Great Lawn Drive in the developing community off U.S. Highway 17A and Interstate 26. The developer is Atlanta-based Wood Partners. The 4,500-acre Nexton community has 400 single-family homes already occupied and will have 8,000 housing units, including apartments, when it is built out over the next decade or so, according to Brent Gibadlo, vice president and general manager. A 1,000-home, 55-plus Del Webb community is part of the plans. A new center to serve the growing elderly population is now open in the Charleston region. Mount Pleasant Gardens features a 71-bed Alzheimer's special care center at 1025 Hungryneck Blvd., near Lowe's home improvement warehouse store. It includes private, semi-private and shared living options. With a courtyard, seating areas, dining room, caregiver support and 24-hour onsite licensed nursing, the facility is a product of JEA Senior Living of Washington state. The company operates an exclusive dementia-care program called "Meaningful Moments." Its founder, Jerry Erwin, developed the memory-care facilities after his own mother's journey with Alzheimer's disease. A Lowcountry-based medical practice is adding a sixth location. Charleston Oral and Facial Surgery recently began construction on a 15,000-square-foot office at 78 Ingleside Blvd. in North Charleston. The firm announced plans to expand on the site after purchasing it in 2012, but some protected wetlands were found and delayed the project. Boyer Construction is expected to complete the structure in 2019. The medical facility will occupy the first floor while the top two floors will be leased. Other offices are in Charleston, Mount Pleasant, North Charleston, Summerville and Bluffton. A Spartanburg-based company is following the home-building business to booming Charleston. Guy Roofing recently set up an office at 460 King St. It offers full-service roofing needs as well as installation of gutters, siding and windows. “Our extension of services into the Charleston market is the continuation of planned growth that began with last year’s expansion of our Spartanburg headquarters,” said Jeff Guy, vice president. The family-owned firm serves residential customers in the Upstate, western North Carolina and now the Lowcountry. Its commercial and industrial division serves clients across the United States. Founded in 1970, it employs 150 workers. Reach Warren L. Wise at 843-937-5524. Follow him on Twitter @warrenlancewise.